The Halloween food ideas on this page have been graciously submitted by visitors like yourself. 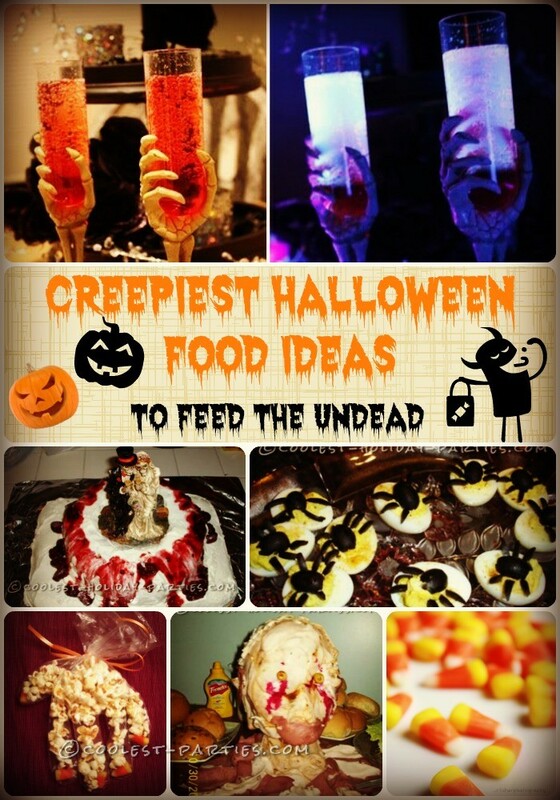 If you’ve got any cool Halloween food ideas to add, take a moment and submit them below. You’ll be taking part in creating the Web’s ultimate Halloween party ideas resource that’s ALWAYS FREE for everyone to enjoy! Take a Latex or any kind of plastic glove, make sure it’s clean on the inside. 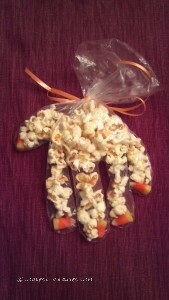 Then insert one piece of candy corn down each of the fingers of each glove and fill with popcorn, tie off the top. Looks like a hand with finger-nails. Peel hard-boiled eggs and cut in half lengthwise. Remove the yolks and mash with mayonnaise, mustard and black pepper. Spoon the filling into the egg white halves. Sprinkle with paprika. 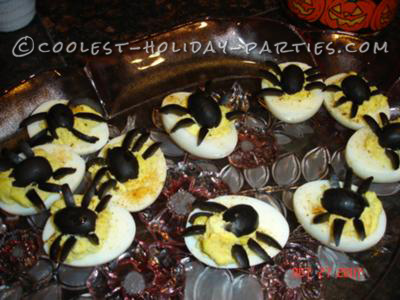 Garnish each deviled egg with a black olive cut into pieces to look like a spider. Make a batch of chocolate cupcakes. Put a dab of frosting in the center, spread it around but make sure most of the frosting is in the center. Use a fork to give the frosting a fury look. Use M&Ms for the eyes and nose and a squished red gumdrop for the tongue. Also use the white tips of candy corn for teeth! Peel hardboiled eggs and cut each in half. Remove the yolks from the eggs and mash the yolks with mayonnaise. Fill the egg-white halves with the yolk and mayonnaise mixture. Press an olive into the middle with the pimiento “looking” up. Sprinkle the yolk and mayonnaise mixture with red pepper flakes and then, for a great added effect, stab each “eyeball” with a toothpick. Mix flour, water and cheddar cheese to make a dough-like substance. Roll it into a ball and press an olive with the pimento facing up. Pull the dough up around the edge of the olive and bake until brown. Make a box of Kraft dinner and add green food colouring. Use Laytex gloves to make different colored Jell-O hands. 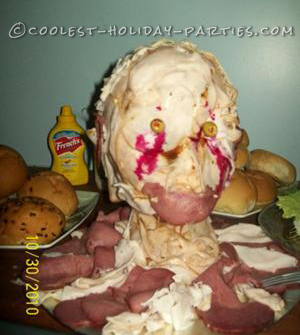 Another awesome Jell-O idea is to use a full-face party mask as the mold. Plug any holes in the mask and spray the inside with non-stick spray. Depending on the size of the mask, mix up a couple boxes of Jell-O (usually about 4) with about a 1/4 cup of milk to give it a more realistic look. Tonic Water contains quinine, which glows under UV light. Now, quinine is what gives Tonic water its bitter taste, so you have to add something really sweet to make it taste good. 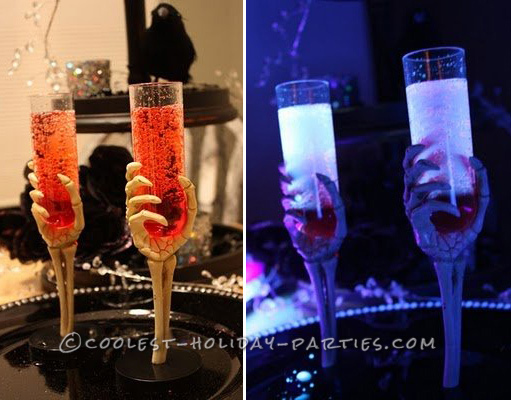 You can add anything you like, I decided to use grenadine syrup (to look like blood). Plus, it sinks to the bottom and makes the drink glow more. Then, your guests can mix their drinks before consuming. Ingredients: Tonic Water Grenadine Syrup (or any flavoring syrup), Black Light (I found inexpensive ones at Wal-Mart). Directions: Fill glass with tonic water. Add about 1/3 as much grenadine syrup (to taste). Turn off the lights & place by UV or Black Light. Serve! You can change up the ingredients to your taste, the sky is the limit!” Here’s the link where we got the recipe. Using kabob skewers and whatever fruit you like (grapes, melon, pineapple, apples, etc) chop up the fruit in chunks and then add a gummy finger candy or other gross body part (like gummy eyeballs) onto the stick for an interesting effect somewhere in the middle. What seemed initially appealing in the fruit becomes kinda gross! Take a few carrots and cut each of them into 3 pieces. Then cut each piece into 4 smaller pieces. Use food coloring dye to paint fingernails (or toenails) and you have monster toes (or fingers)! You will need a cauldron for the brew to be made in, Sprite, Hawaiian Punch, Orange Sorbet, Ice trays and Gummy Worms. You first need to put water in the ice trays and then in each cube put a gummy worm. Put the trays in the freezer until frozen and when they are ready you can make the brew. Mix up equal amounts of punch and sprite into the cauldron when you are ready to serve the punch add in some of the orange sorbet as much as you like. It will melt a bit as you put it in which is fine. Now you can use the worm cubes in the cauldron or put them in each cup just before you put in the brew. For an added effect you can get a small piece of dry ice and place it in the brew to make some mist come out to look like a real witches cauldron would. Take some cranberries and squeeze the juice out of all of them by pressing one by one. Then, once that is done put it in the fridge and let it sit there for about 30-50 min. Then you have your dried scabs! Worm Casserole: Mix cooked egg noodles and spaghetti with butter and grated cheese. Bake until the cheese melts. Sprinkle with bread crumbs (dirt) and bake again until toasted. You can also boil pasta and call it “Guts”. Clean the Styrofoam head (soap & water). Smother head with BBQ sauce and begin applying sliced meats (use toothpicks to secure meat). Continue this process until entire head is covered. Take toothpicks & stick through the olives where eyes should be. Drip red food dye over eyes for dramatic effect. Enjoy! Take tootsie pops or dum dums and then take white tissues or tissue paper. Wrap the tissue on top of the lollipop and tie right where the stick meets the lollipop. Make a face on the ghost if you want and arrange them how you wish – maybe in a black and orange tiny pail with the ghost head sticking up. It’s a good treat and cute for a center piece on your table. Take refrigerated bread dough and shape it into a body and head of a spider, then do the same to make legs, then cook it on 375 degrees for twenty minutes. Then cut a circle in the abdomen of spider, and place 8 cooked jalapeno peppers in the circle. Then take marinara sauce and call it spider guts! Cut off tops of oranges. Gently hollow out pulp (reserve for another use), leaving a thick shell; hollow out pulp off tops also. Cut Jack-O-Lantern faces into each orange. Pack chocolate ice cream into shells, avoid letting ice cream come out of holes. Cut a hole into top of orange top. Set tops back on, over ice cream, and insert cinnamon stick stem through the hole. Place in freezer for at least 3 hours, or until serving time. 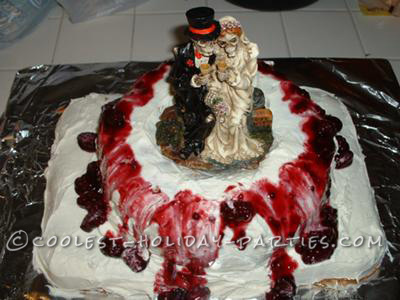 Ok, it was not for an actual wedding, it just sort of grew into a wedding cake for the Halloween Party. Halloween Wedding Cake topper (you can get them on eBay, or at wedding shops) or Dia de los Muertos cake topper or Corpse Bride Cake Topper, (you get the idea)…Mine is resin. Cleaned and supported well, just about any appropriate sized statue could work (by the way, the bride and groom in my picture are from the “Love Never Dies” collection). Make the rectangular cake first. Make one entire box of white cake mix in this pan. I didn’t have a plate big enough to hold it, so I covered a cutting board with aluminum foil. Let the cake cook for about 10 minutes. Then you put the board, aluminum side down, over the cake pan. With kitchen “hot pads” grasp the cake and the cutting board together and invert. The cake will fall onto the board. Then remove the cake pan and the cake is in place on the board. Make an entire white cake mix and fill the bundt cake pan to bake. While the bundt cake is baking, you can frost the rectangular cake. I used white icing. When the bundt cake comes out of the oven, it will be way too hot to put near the frosted cake. Let it cool for about 10 minutes. Cover the bundt pan with a dinner plate that fits and invert it. The bunt cake will be in position on the plate and the pan will come away. Let the cake cool completely on the dinner plate. When the bundt cake is cool, use a second dinner plate and invert again. Now invert this plate again using a hand under it for support, and the cake lands in place on the rectangle cake. Use matching white frosting and frost the bundt cake. Use the frosting to seal any spaces between the bundt and the rectangle cakes. The bundt cake has a hole in the middle of it. Don’t worry about frosting in there. Set a tiny plastic snack cup in there (right side or upside down, whichever fits better, it doesn’t matter). Put your cake topper centered on the plastic cup. If part of the topper hangs over, don’t worry about it. The bulk of the weight is still on the cup. Make the fit seamless and invisible with a little frosting as needed. I opened a can of blackberry pie filling. Pouring off some of the sweet syrup, I came to sweetened blackberries in the can. With clean fingers and a toothpick, I moved the blackberries only (no syrup scooping) onto the top of the bundt cake. I made a complete circle around the top of the cake, aligning blackberries and setting then in place. When I walked away, gradually, the blackberries started to slide down the cake. Seriously, it was in a circle when I left it. As the blackberries moved, they left tiny black/purple trails across the white icing. There was only the sugar syrup inside each blackberry, I drained the syrup off before I made the circle. The result is in the picture. Even though the blackberries are drained, they tumble down the cake anyway. The effect looks like blood and the blackberries appear like blood clots. To give the illusion of a real cake, mix tomato paste with mashed potatoes, and create roses to use on the top. Use green food coloring and mashed potatoes for the leaves. All you do is take Twinkies and frost them leaving a open space at the head to put to M&Ms for eyes and you’ve got a quick little easy snack for your Halloween party! For appearance you can also smash up some Oreo’s for a dirt kinda look and to add some real fun to it sprinkle some gummy worms around your yummy mummies! Use a clean/new flower pot or planter. Use your imagination for a fun container. Line with plastic all the way to the top if there is a hole in the container. (TIP: Freeze the Oreo’s for an hour or two, then put them in a Ziploc bag and smash up really well. Then shake it around and the cream filling will turn into little balls that look like fertilizer). Spread a layer of the smashed Oreo’s on the top to look like dirt. Add Gummy Worms hanging over the side. Add fun elements like spiders or maybe grave stones made out of sugar cookies.